Every so often, corals arrive in dealer’s tanks with a few hitchhikers. 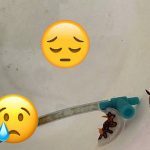 Some of these interlopers aren’t welcome of course and there are numerous methods to prevent unwanted pests and diseases from entering aquariums. 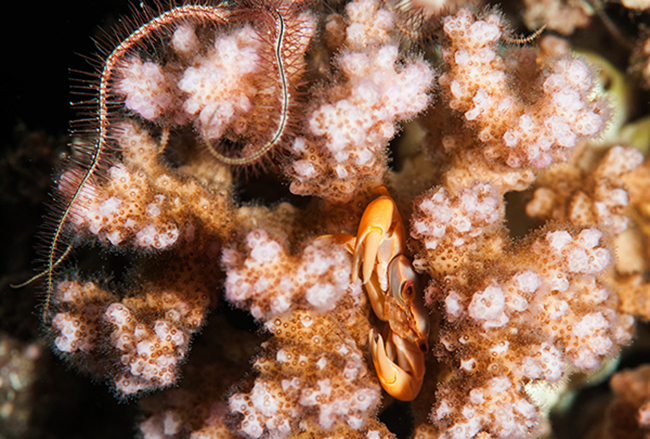 But sometimes, something slips through – and when that something is a coral crab, I think it’s a win; they’re utterly charming. 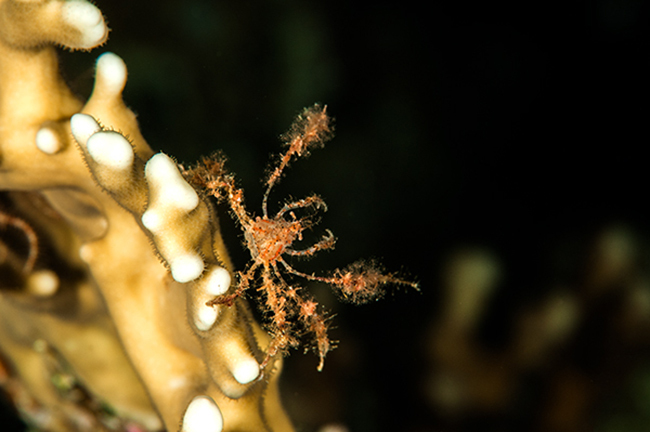 There are several genera of ‘true crabs’ (the Brachyurans) that associate with SPS corals, though the most significant are Tetralia and Trapezia. The animals live within and are protected by the coral structure, so dense corals such as Pocillopora offer excellent habitats and in the wild, the partnership is common. 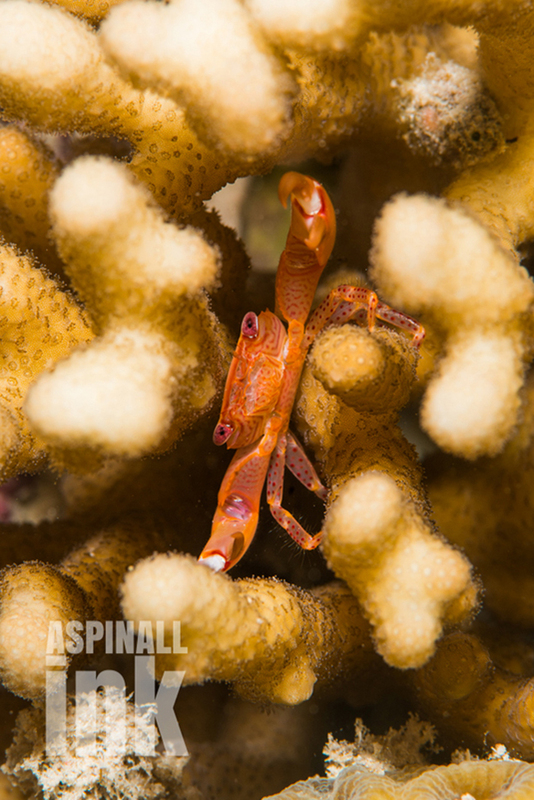 It was once believed that the crabs were parasites on the corals they inhabited, but more modern thinking suggests that the crabs are part of a more mutualistic relationship. 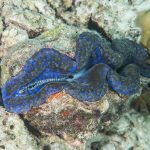 While they may irritate the coral and feed on its mucous, they play an important role in keeping the coral free from detritus and may even help defend the coral against predation, ‘nipping’ at the numerous but delicate feet of sea stars such as the Crown of Thorns, which are significant coral predators. 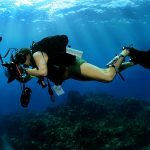 Added to that, they may also help provide increased water circulation amidst the ‘deeper’ areas of the coral and may even provide nutrition for the coral through their waste. Trapezia sp. in Stylophora sp. 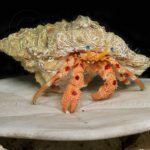 Photographing Coral Guard Crabs in captivity has always been difficult for me, but in the wild, I have had some limited success so thought I’d share these images. 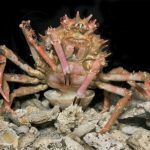 OK, not a Coral Guard Crab, but this Spider Crab (Achaeus sp.?) was an interesting character. 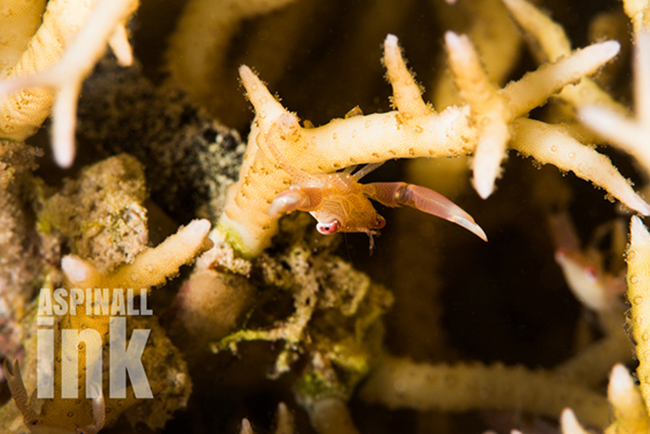 So, if you find a wee crab scuttling through your corals, fear not, its likely beneficial. P.S. I’d love to know the species names of the critters featured here. Please feel free to leave me a comment.